Looking for the ultimate Annapurna circuit packing list? From what to put in your daypack and the best hiking clothes to take, to the essential hiking gear you need for a successful summit, we've got you covered. Trekking the Annapurna Circuit was one of the most jaw-droppingly beautiful, life-changing experiences we've ever had on our travels. Preparing what gear to take for a trek like this is definitely a tricky act; it's all about finding the balance between packing as light as possible, while still maximising the gear that you do take. Get it right, and you'll breeze through your days on the circuit easily. Get it wrong, and chances are you'll spend some very cold nights dreaming of that extra fleece jumper you left behind, need some intensive massage therapy to cure the knots in your back and shoulder from carrying too much stuff, or worse: risk your chances of summiting altogether. That's exactly why we've put together this Annapurna circuit packing list, full of our packing tips, the clothes and gear we couldn't live without on the trek, and the hiking essentials you'll absolutely need. Before you head off for the adventure of a lifetime, make sure you check out the rest of our Nepal posts for everything you need to know before your Annapurna trek, and our top tips for the circuit too! Know what season you're trekking in | Nepal's seasonal changes (particularly around monsoon period) really impact on where and how you can hike, as well as what you'll need to bring with you for a successful summit. The optimal hiking periods for the Annapurna Circuit are between October and early December, and late February to April. Trekking outside of these times (during winter or the monsoonal summer rains) can mean hiking in heavy snow or heavy rain - which means you'll need to bring adequate weatherproof gear. 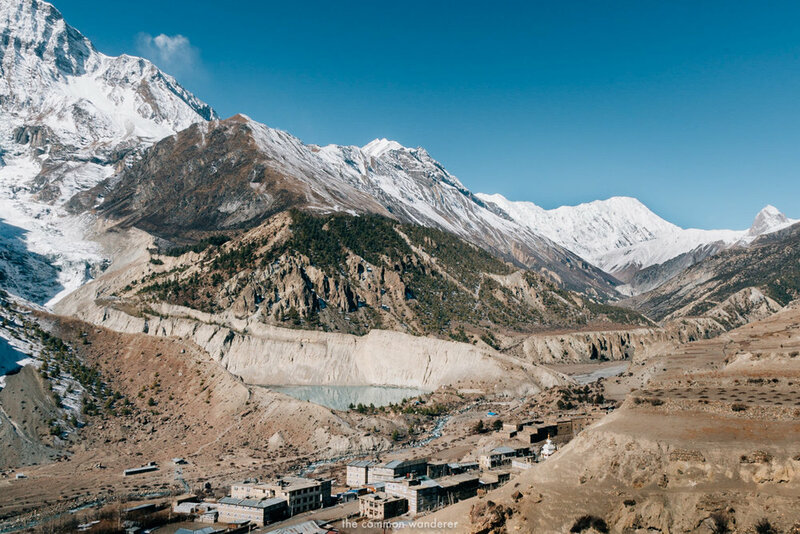 The climate varies dramatically throughout the trek | The Annapurna circuit winds through everything from tropical plains to alpine climactic zones. Some days, you'll hike in shorts and t-shirt and stop for sweaty water breaks constantly. Other days, you'll wear all your clothes as the -15c temperature and brutal winds freeze your water bottle solid. Make sure you're adequately prepared for both! Bring only what you need | Unless you're hiking the circuit completely solo, you'll likely have both a guide and porter/s for your trip. While porters may seem superhuman, they are, in fact, very human; with extremely human muscles and backs that are equally prone to injury. Help them out here by bringing only what you really need (10kgs or so), and leaving the rest locked up safely with your guesthouse in Kathmandu. Your porters (and their spines) will thank you later. You can buy lots of hiking gear in Kathmandu | When it comes to hiking gear and clothes, Kathmandu has just about everything you could ever want. That said, much of the gear (particularly around Thamel) is either at the cheaper end of the scale, or is actually a very convincing counterfeit. We found that often these items just didn't quite stand up to the harsh weather conditions, particularly at the higher altitudes. This is the backpack you'll have with you all day, every day on the trail. Obviously it'll be full with all your essential hiking snacks, but it needs to also have capacity for an extra jumper or your down jacket, a rain jacket, waterproof trousers, your camera, lots of water (generally 3-4 litres), sunscreen, a hat, sunnies, and any other personal items you might need. We'd suggest a day pack with a little more support and definitely with a waist strap; we use the Fjallraven Abisko Hike 35L daypack and we absolutely love it. Not being able to keep track of where all your various bits and bobs are is one thing when it's your own pack. But when you're on the Annapurna Circuit, all your gear goes into a pack provided by the trekking company (for the porters to carry) - and the last thing you want is your stuff ending up all over the place during the day. Packing cubes help you compartmentalise your stuff, like clothes, undied, cables and electronics, spare warm gear, keeping everything neatly separated for you till you need it. If you're not already using them, we promise you: they're about to change your freaking life. Nothing will put a dampener on your trek quite like wet gear (we're not sure if we intended that pun, but let's go with it). The waterproof dry bag is one part water protection, one part vacc-seal bag, all parts luggage saviour; invaluable for keeping our clothes dry during rainy days on the trail, gifting us extra space when we were struggling to fit an extra warm jacket amongst our rain gear and snacks, and protecting our cameras from rain and dust. We use Sea to Summit's dry bag range in a range of sizes to suit clothes, electronics, camera gear etc. We say this every time - if you can't afford to go on your epic trip with travel insurance, you can't afford to travel at all. Not trying to be a Debbie Downer over here, but 10-16 days of physically and emotionally demanding trekking, at altitude, through some pretty extreme landscapes can be a recipe for disaster. As the 2015 Nepal earthquake showed, the unexpected really can happen. We personally travel with World Nomads - search for your own quote here. You'll stay in teahouses for the majority of your trek; pretty little things made from rock and wood that provide a cosy, warm relief at the end of a long days trekking. All teahouses supply blankets, but bear in mind that they're not washed overly regularly and are absolutely not thick enough to keep you warm in the depths of those cold mountain nights at altitude. Mim rented one in Kathmandu that just wasn't quite up to the -15c nights in the last few days at altitude. We'd recommend investing in RAB's range of sleeping bags and bringing yours from home. Whether you decide to hire a sleeping bag or bring your own, always bring a sleeping bag liner (we use these Sea to Summit silk liners). They add a toasty extra layer of warmth to your sleeping bag, and a little extra protection if you're not too sure how clean your sheets or hired sleeping bag are. On an average day on the Annapurna Circuit, you'll need to be drinking between 3-4L of water. Pack a couple of reusable water bottles in your day pack or this is a great way to avoid contributing to the 200 billion plastic bottles used each year, but clean drinking water isn't always available on the trails. Our recommendation for these times is the Water to Go bottle. Reliable electricity isn't always something you can find once you're on the circuit - and when you do, you often have to pay to charge your devices in various teahouses. Travel with a solar charger and harness the almost ever-present sun on the hiking trail to keep your gear charged instead. We use the Anker Powerport Solar charger, which also has dual USB ports to charge multiple devices, like a phone and a gopro, at the same time. This might seem like a weird essential, but a roll of duct tape can literally solve almost every issue, from a rip in a bag to a hiking boot with a toe poking out, or taping gauze strips to blisters when you've run out of blister plasters. Pretty much any problem you can think of, duct tape can go a long way towards fixing it. You'll have plenty of time in the evenings to chill out and relax, so bring along a decent book with you - or a Kindle loaded with all your faves. Mim read 'Himalaya' by Michael Palin while in the mountains and it really brought those pages to life! Yep, we're those people who always travel with a first-aid kit in our backpacks just in case. But here on the Annapurna circuit, there's plenty that can go wrong We're talking blisters, sore joints, rolled ankles, back pain, altitude symptoms, stomach upsets; you name it, you or someone in your group is likely to go through it. It always pays to have a well-stocked medical kit in your possession. Altitude medication like Diamox (see your doctor about this). When it comes to what to pack for the Annapurna circuit, focus on lightweight, breathable fabrics that are quick-drying, moisture-wicking and can be washed easily by hand. This is probably the maker-or-breaker of your trip; a quality pair of (broken in) hiking boots. These things will be on your feet for about 10 hours a day, so you want to make sure that they're comfortable, have great support for your feet and ankles, and basically just keep feet feeling like they're ready to go day after day. Make sure they're waterproof, as the last thing you want is a pair of boots that get soggy on the first day and never dry properly. Mark travelled with the SCARPA Men's R-Evolution GTX on two separate backpacking trips through Africa, up Mt Kilimanjaro, and through the Annapurna Circuit, and they've never let him down. Other great options are the Columbia Cascade Pass Waterproof boot (super light), and the Merrell Moab 2. These are a godsend when you just want to chill out in the teahouse without having to stomp around in heavy boots (or you're just not doing any overly strenuous exploring today). We'd recommend a trusty pair of light sneakers and/or pair of flip flops and to see you through (you'll want these for shower time!). We travelled with a pair of Havaianas each, and a pair of Converse (Mark) and Nike Roshes (Mim). You can wash these as you go! For socks, you'll want pretty thick woolen socks to keep your feet snug in your boot and prevent rubbing. There's also nothing quite like slipping your tired, worn-out feet into a fresh pair of warm socks after a long day, so our tip is to always keep a nice clean pair separate from the rest of your socks exactly for this purpose. You'll want some thermal layers under your hiking clothes to keep you snug when the temperatures start to plummet on the Annapurna Circuit. We took two thermal tops and two bottoms each. Mens thermal tops here and bottoms here, womens thermal tops here and bottoms here. We're not normally proponents of hiking pants; we practically live in jeans (Mark) or leggings (Mim) almost everywhere we travel. But we gotta tell you, this is a place you really want to invest in a pair hiking pants. They should be comfy enough to see you through the day, stretchy enough to allow you scramble up and warm enough to keep you, well, warm. We'd recommend bringing a lighter pair of hiking pants, and a thick, fleece-lined or insulated pair for the higher altitudes. You'll likely end up wearing both pairs in the freezing final days of the Annapurna circuit too. For lighter hiking pants: the Columbia Silver Ridge and prAna men's Bronson pant are great options for men, while the Columbia Women's Full Leg Roll-Up Aruba Pant can be rolled up to capri length on hot days for women! PrAna also have a fab range of women's hiking pants (the Halle or Briann), and their leggings are super comfy. For insulated pants: look for a ski-pant style of hiking trousers with a weather-resistant outer, fleece-lined inner, like these for men, and these for women. Like a fresh pair of socks, there's nothing better than getting changed out of your sweaty hiking gear and into a fresh, clean pair of tracksuit pants or leggings. Pack a lightweight pair for evenings at the teahouse. These are handy for the more tropical lower levels, but ladies, do keep in mind that Nepal is a relatively conservative culture and that super short shorts aren't acceptable. The synthetic, moisture-wicking kind that you'd wear to the gym are the best type of tshirt for your Annapurna trek as they keep you cool, stay relatively stink-free and breathe under all your layers. Look for regular sport training tees (ladies version here) or tops specifically designed for hiking/outdoor elements like these (ladies version here). Even if you're travelling in the summer months, nights are honestly bitterly cold up in the mountains. This is particularly true the higher you go, and after about 3,000m you'll want to be wearing pretty much all your clothes, most of the time. We tool a nice thick fleece each from home, and also picked up a couple of thinner cashmere jumpers in Thamel to layer underneath when needed too. Our fleece recommendations are: the Columbia Mens Steens Mountain full zip or the North Face TKA 100 Glacier fleece for men, and the North Face Women's Glacier 1/4 Zip for the ladies. We can't emphasise the need for a warm jacket enough! Temperatures can plummet to a snowy -10c on your final few days, and if you're not adequately prepared you risk getting hypothermia and ruining your summit attempt. We had someone in our own trekking group almost not make it due to the cold and not having an adequate jacket. Don't come all that way just to be turned away from the top at the last hurdle. Mark has the North Face Nuptse 700-fill Down Jacket, which has seen him through Kilimanjaro (Tanzania), Everest Base Camp, and the Annapurna Circuit without so much as a chill. For the ladies, the womens North Face Nuptse Down Jacket works a treat. Essential for keeping out the wind (it's seriously windy on the final few days, particularly over the Thorong La Pass and the very aptly named Windy Valley) and protecting you against any unexpected rain showers. Gore-tex is your best best for keeping dry. Mark uses the North Face Resolve rain jacket, and Mim has the female North Face Venture rain jacket. Just as a weatherproof jacket will keep your upper body protected, a good pair of wind/waterproof pants will go a long way too. Mens waterproof pants here, womens version here. We wouldn't normally hike with poles, but decided to hire a pair in Kathmandu at the last minute. Turns out, these guys saved our joints (particularly both our dodgy knees) on the descent from the Pass, and we'd highly recommend either buying a pair for future hikes, or hiring some in Thamel. Your final ascent to the Thorong La Pass will generally begin somewhere between 2-3am, and trust us, that path is pitch black until the sun finally starts to peep over the mountains around you. Make sure you have a decent headlamp (and lots of spare batteries!) for this night! They're also super useful in the evenings as electricity is often limited in the teahouses at night, and is generally only available in the main areas of your accommodation. Trust us, you'll definitely want it for that late night toilet trip! Your peepers will be staring across snow-capped mountains and deep green valleys for days on end - protect them from damage with a good pair of polarised sunnies. Opt for a snug-fitting baseball cap to avoid chasing after it when the wind blows it off your head! Keep your head warm! Whether you prefer thermal material, thick wool, or a mix of the two - you absolutely need a beanie on your trek. We almost always have a buff with us when mountain hiking; strong winds can make your neck and face seriously cold! They come in all colours and prints, so search for your favourite one here. Your. hands. will. freeze. without gloves on the Annapurna circuit. Invest in a good pair of fleece-lined (preferably waterproof) gloves to keep your fingers toasty. You'll need them to snap your epic summit pics! We have North Face Apex gloves. Always keep lip balm on you to protect against the mountain conditions; the burning sun, the wind in your face, and dusty air on the trails. One with SPF (like this Banana Boat SPF 50 version) is even better! You'll be in the sun for anywhere between 6-12 hours, every single day of your Annapurna trek. Some of those days will be spent in direct sunshine that feels relentless, other days it might reflect off the snow around you, and others you may barely notice it through the clouds (but it's there - and you're closer to here than anywhere else!). Pack a decent sunscreen (minimum SPF 30, but ideally SPF 50), and keep your skin healthy and burn-free. We actually found it pretty hard to track down a quality sunscreen that didn't cost a fortune in these parts, so we'd definitely recommend bringing enough for your whole trip from home. 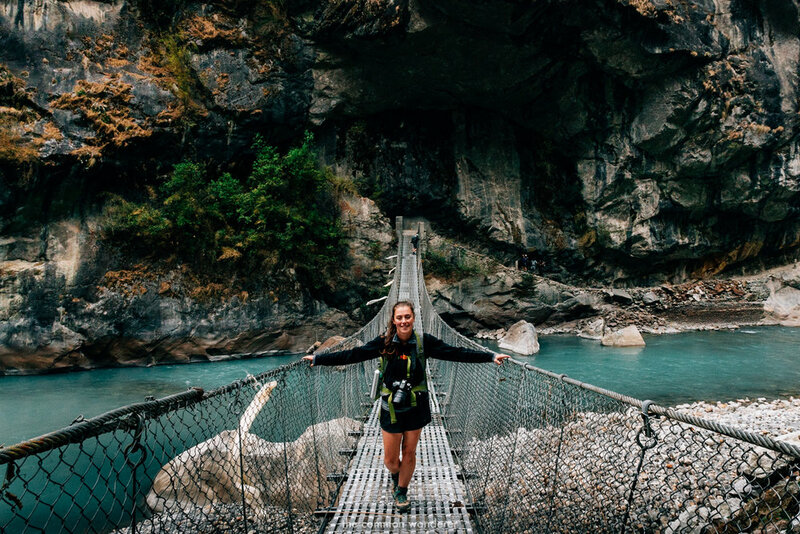 Pack all those essential toiletries you just can't live without and bring them with you for your Annapurna trek, as you'll soon discover that it's nigh on impossible for find all your favourite deodorants or hair or skincare products here. Ladies, this also applies to female hygiene products: bring your essentials from home, or risk not having anything at all (tampons are virtually non-existent). MoonCup - seriously gals, Mim just switched to this and it's an absolute game-changer. Better for you, better for the planet. Rosehip oil - great moisturiser all-rounder without oodles of plastic packaging. Note: Always pack spare toilet paper in your daypack. I repeat: ALWAYS. PACK. SPARE. TOILET. PAPER. This is a rare commodity on the trails, so best to be safe, and it also doubles up as napkins, tissues, etc! Having a small bottle of hand sanitiser in your daypack is also a good idea. The landscapes are epic, the photography opportunities insane, and you'll want to be able to capture some of your mountain moments to keep as memories forever. Camera, obviously. What type depends on how interested you are in photography. We never travel without our dSLRs (Sony a7riii + Canon 5D Miii). LOTS of SD cards - you'll fill them quickly! Lens cleaning kit - dust, wind, and cold will wreak havoc on your lenses! One of the most debated topics when it comes to hiking in Nepal is this: should you do it with an organised group, or heave a rucksack onto your back and go it alone? Personally, we opted for a group hike on Intrepid's 16-day Annapurna Explorer trek, and we'd absolutely do a group hike again if we went back to Nepal for more hiking. That said, we definitely encountered just as many a keen hiker going it alone or with a friend. In short, both are absolutely viable options, and each comes with their own merits and disadvantages. You can read our full pros and cons list for both options here. Are you keen to trek the Annapurna circuit yourself? Or perhaps you've travelled there already and have your own Annapurna circuit packing list tips to share? Share your stories in the comments below! Our complete guide to Airbnb + your free Airbnb coupon!